If we’ve learned anything from Willy Wonka, it’s that candy makes the world taste good. But you don’t have to take an ill-fated tour of a chocolate factory to enjoy tasty treats. Arizona is home to some truly sweet candy stores. You’ll find homemade fudge, classic brands, and even some uniquely Arizonan delicacies on the menu at these local shops. Here are the 10 best candy stores in Arizona. Sweeties is the closest thing Arizona has to Candy Land. This massive candy emporium is the largest candy store in Arizona. They stock their shelves with over 100,000 pounds of candy each day. To say they have a wide selection of candy would be an understatement. Virtually every candy imaginable can be found at their storefront. Family owned an operated for over 60 years, Sweeties is also filled with many old-school candies. You’ll feel like a kid again while browsing their selection of Pez, Jelly Belly, or Double Bubble. 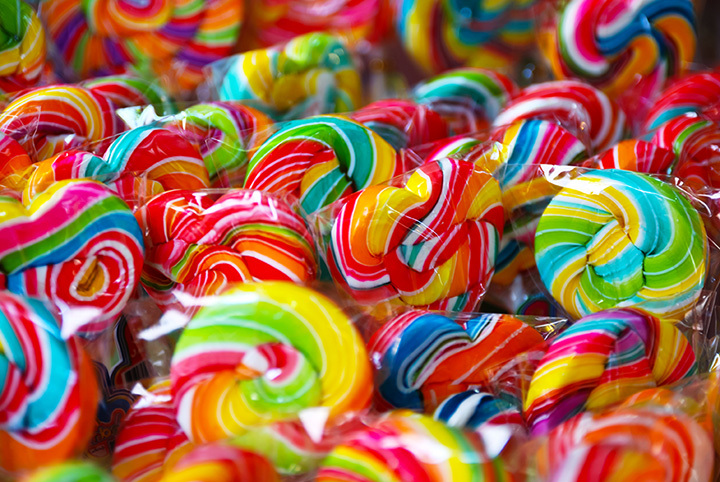 If you’re a true sweet tooth, Sweeties also has an assortment of candy available for bulk purchases. Sweeten your day at the Sedona Fudge Company. This small shop has become a Sedona fixture by selling fresh homemade fudge. Upon walking into their store, you’re greeted by friendly staff and an irresistible aroma. They have an assortment of fudge flavors sold in half-pound slabs. You’ll find 17 mouthwatering flavors including chocolate peanut butter, vanilla cream cheese, and chocolate raspberry. Dessert fans will also love their cookies, toffee, English truffles, and caramel apples. Their fudge is sold in gift baskets and online so you can snack on these delicious treats year-round. Cerreta Candy Company isn’t just any neighborhood candy shop. For one, they offer free 30-minute tours of their factory for a behind the scenes look at candy production. Second, this family-owned business produces some of the best chocolates, brittle, and fudges in the state. For over 40 years, Cerreta has been delighting locals with their assortment of molded chocolates, creams, and caramels. This family-owned business uses four generations of manpower to produce their locally made chocolates and candy products. You can take a trip to the past at Sweet Shoppe & Nut House. This candy shop is located in a 100-year-old mercantile in historic downtown Flagstaff. They also sell nostalgia candies including retro favorites like candy necklaces, Root Beer Barrels, and Lemonheads. The Sweet Shoppe also specializes in decadent treats. You’ll find everything from gourmet caramel apples to old-fashioned fudge and artisan chocolates lining their shelves. That’s not to mention the espresso, truffles or chocolate dipped fruit. Their selection of handmade and all natural sweets has made this the go to candy shop in Flagstaff. Old Town Candy & Toys is the perfect place to unleash your inner child. This vintage candy store has old-fashioned candy and collectibles for a walk down memory lane. This Old Town Scottsdale candy shop also has over 150 bulk candies available. You can fill a bag and pay for your goodies based on weight or choose from their large selection of pre-packaged sweets. In addition to old-school favorites, Old Town Candy has a mix of toys and Arizona related items including cactus candy and scorpion suckers. Candy Addict’s name might be a little too on the nose. This Mill Avenue candy shop features over 1,500 types of candies. Their selection is so large that one trip to Candy Addict can turn even the most casual candy fan into true sugar fanatic. Their items include a mix of nostalgic brands, international candies, and big name favorites. They also have military and senior discounts, daily specials, and punch cards for loyal customers. Virtually every kind of treat is on display at Treat Center on Courthouse Square. You’ll find ice cream, malts, caramel apples, caramel corn, fudge and more at this candy store. Located on Prescott’s Historic Whiskey Row, Treat Center has become an attraction by offering tasty old-fashioned treats to tourists and locals alike. You’ll find familiar candies like Razzles and Bottle Caps at this small-town mom and pop. Campus Candy serves up over 400 types of candy to sweet-toothed University of Arizona students. This delightful candy shop is located on the University of Arizona’s Main Gate Square. Their candy selection includes a mix of modern and retro candies from many different decades. Campus Candy also specializes in frozen treats. They have 15 ever-changing flavors of kosher yogurt, Italian ice, and gelato. However, the real beauty is in the toppings. Campus Candy’s entire store is a toppings bar and you can put any of their candy on your frozen yogurt for maximum flavor. Chocolate connoisseurs have their hands full at Zak’s Chocolate. This family-owned chocolate shop has made world-class artisan chocolates by keeping it simple. All their chocolates are made using three simple ingredients: Cocoa beans, organic cane sugar, and cocoa butter. The result is an amazing selection of creamy smooth chocolates. You can sample, enjoy, and purchase their award-winning chocolates at their Scottsdale factory. In addition, Zak’s offers chocolate-making classes where you can learn to concoct your own delicious desserts. Cactus Candy serves up unique candies made from prickly pear cactus fruit. This candy shop might not have classic candies or big name brands, but you’ll get to taste a true Arizona treat. You can buy sample-sized candies in bulk bags in Cactus Candy’s original Phoenix location. This hole-in-the-wall is stocked with candies, hot sauces, jellies, and marmalades made from Arizona’s most distinct plant. The tasty candy is also a great souvenir to show tourists that Arizona is still the Wild West.